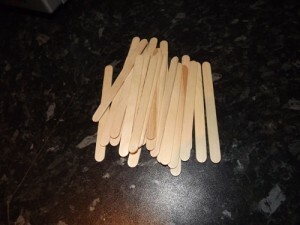 Tonight I had the tea that dreams are made of…. 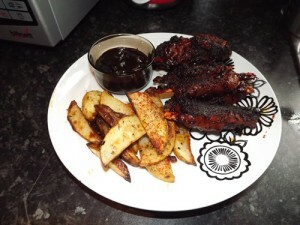 vegan sticky barbecue spare ribs! Before I turned veggie, I’d do BBQ ribs at least once a month. 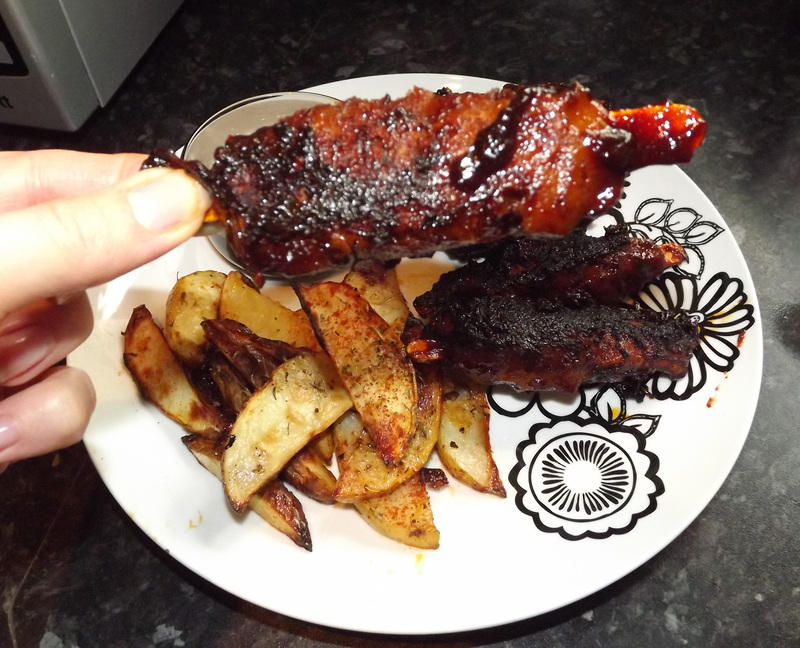 Well, it’s officially been a year since I last ate meat (let alone a spare rib) so I am feeling rather smug with myself for coming up with this recipe! It’s quite a laborious manufacturing process as the recipe involves making your own seitan, but it’s so worth it. The results of your hard work are succulent “ribs” with a crispy, sweet sticky coating and a good meaty bite…. 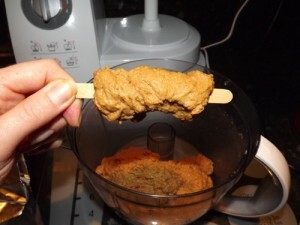 First you have to make your seitan! Whisk together cooled vegetable broth, olive oil, garlic, soy sauce and Tabasco sauce. In a separate bowl, mix together the wheat gluten, paprika, gram flour, nutritional yeast and pepper. Make a well in the centre of these dry ingredients and pour in the wet ingredients. 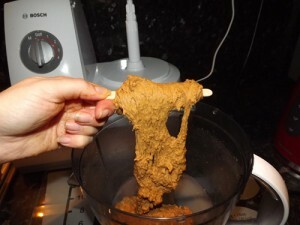 Stir well with a wooden spoon until everything is combined and a soft dough is formed. You now need to get the dough onto the lollipop sticks. 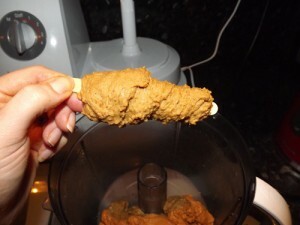 The best way I found was to stretch a bit of seitan over the stick, then twist the stick so that the seitan wraps around it. Once you have the right amount of “meat” on the “bone”, use your hand to try and mould the seitan into a rib shape. 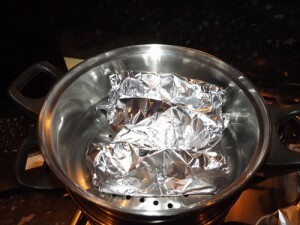 Wrap each rib loosely in a bit of tinfoil (I managed to get 16 ribs out of my dough), and put into a steamer for 30 minutes. Allow to cool and refrigerate until you’re ready to use. Heat up 1 tablespoon of olive oil in a frying pan and then stir in the pepper, smoked paprika and turmeric. Then add the onions and just as they start to soften, stir in the tomato paste, BBQ seasoning, soy sauce and tabasco. Once heated through, add a little water to thin the tomato paste out and add the ketchup, treacle, golden syrup and sugar. Mix well with a wooden spoon and heat until the sauce starts to boil. Next add your spare ribs and roll them around to coat them. Leave boiling until the sauce starts to stick to the ribs. I gave myself six ribs, but this was far too much – four would have been plenty. Luckily for me, ratties seem to love vegan spare ribs too, so the little fatties shared my last one between them. 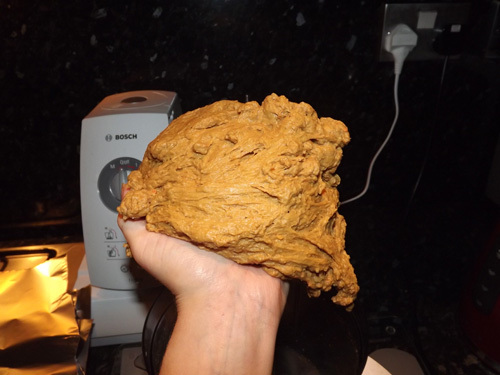 I have also popped some of the left over seitan into the freezer, so I will have to report back on how well it kept*.